PoV supports a true 3 Megapixel video transmission for higher image clarity, as well as image and exposure compensation functions, which meet the highest technical specifications supported by current Instant Messaging software such as MSN, Skype and Yahoo Messenger. Please update your Skype software to version 3.8 or later. PoV is compatible with Skype and other Instant Messaging programs such as Yahoo Messenger, MSN, AOL, Windows Live Messenger, and more. When using Skype, PoV has the added feature of being able to send snapshots to your Skype contact with one click of the special Send button. Please make sure that you are downloading the correct files for PoV (Point of View), not P2V (Point 2 View). You can manually adjust focus by rotating the tip of PoV. For more details, refer to the user manual, page 7. The remote monitoring function does not work. The remote monitoring function works with Skype version 4.1 or before. If you are using Skype version 4.2 or later, please downgrade it. You can download an older version of Skype from here. What is the difference between web cameras and normal video cameras? 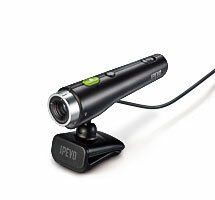 Web cameras (webcams) are specially designed for transmitting live video or images while online. Normal video cameras (like your digital camera) are used to record film footage. You do not need to connect them to the computer, so they can be used anywhere as long as the batteries are charged. The recorded video is stored on a tape or the hard disk of the device. By contrast, webcams are used in conjunction with computers, and require network access via the computer's Internet connection. Software that supports online video transmission allows the device to be used in video chats with other users.